The Leafs were lucky to grab a pair of points last evening, in the 4-2 win over Columbus. Both Mitch Marner and Freddie Andersen were fantastic, And yeah, Zach Hyman’s pair of goals were part of a steady game, as well. You can also say Morgan Rielly was strong, but it went downhill from that. The first period was terrible. 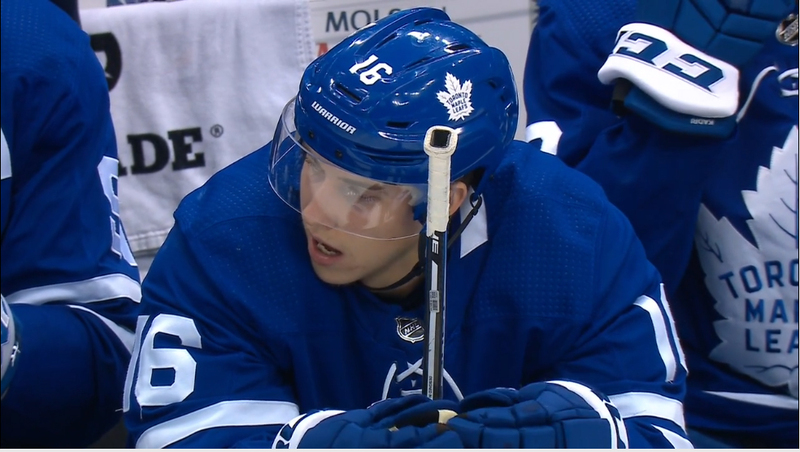 As for Marner – he just takes hold and controls the game at times. Last night, he was credited with 10 controlled zone entries. The puck sticks to him. When was the last time you can say you saw a kid in Toronto that had that kind of talent? And his passes once he penetrates the zone are tape-to-tape through traffic..
Travis Dermott blew a skate mid-way through the third. The bottom fell apart a long ways from the Leafs bench. Here’s the result. This is the first time the Leafs have had 15 wins after 21 games since 1934-35. The Leafs are in first in the league with 30 pts in 21 games. The Raptors are 13 wins in 17 games, making them first in the NBA. And the Blue Jays… Never mind. Hat tip to the two MLSE properties. Mitch Marner has 28 pts so far and shares third place in NHL scoring with Connor McDavid. Very impressive. Mikko Rantanen has 32 pts in first. And while we’re talking about pts leaders – Morgan Rielly is tied for 7th with 26 and John Tavares is in 11th with 25. Goaltender Ian Scott, drafted by the Leafs in 2017 in the 4th round and 110th overall, continues to shine for his Prince Albert Raiders. He has been named WHL goaltender for the week. It’s the third time this season he’s got the nod. You have to think he’s at the top of the short list for Team Canada’s Junior squad. Next action for Toronto is visiting Carolina Wednesday evening. On November 20, 1934 Busher Jackson sets the NHL record (since tied) for most goals in one period with four at St. Louis. Couch’s Corner is a daily look at the Leafs, penned by Rick Couchman. Rick worked for years as a member of the Leafs media writing and interviewing for Stan Fischler and The Fischler Report . He was also a morning show on-air regular with 570News for numerous years, as the Leafs contributor.